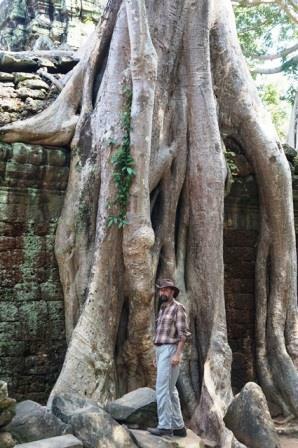 I arrived in Siem Reap towards the end of November 2015, Cambodia has Visa on arrival or Evisa depending on your Nationality, bring a passport size photo, you will need it. Expect long lines at the immigration and visa counters, best to fill out all the required visa forms in the flight. Once the visa and immigration stamp was on my passport, I exited the airport, there is line of tuk-tuk and cab drivers with names on paper, my hotel had arranged for airport pickup and my Tuk-tuk driver was waiting. I got talking to the driver on the way to my hotel, seemed like a very nice gentleman and hired the tuk-tuk driver to take me to the temples the next day. The driver wanted to start at 4:30 AM so that I could see the sunrise over Angkor Wat, I suggested 8AM as there was no way I am waking up that early on my vacation. US dollars were accepted every where in Sien Reap. It is possible to see all the temples in detail over Two Days. You’ll need a pass which can be purchased at the ticket office. Get caught without the correct permit and you’ll get a fine. One can get a 1 day or 3 day Pass, the ticket office will take your picture and it will be on the ticket, so it cannot be used by anyone else. Temples can get hot during the day so plan your visits for a dawn start or later in the day. And make sure you wear good shoes as many surfaces are uneven in the temples. As a World Heritage Site, the Angkor temples at Siem Reap are one of the most famous in the world and a must see for anyone visiting Cambodia. 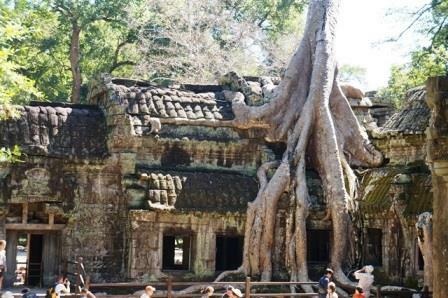 From Angkor Wat to Banteay Srei there are several renowned sites to visit. Temples in Siem Reap were originally Hindu temples, they have Buddha statues in them now. One of the most iconic temples in the world, Angkor Wat is a must. This is the earth representation of Mount Meru, a holy mountain to Hindus and is renowned for its carvings. Go for the sunrise to see the changing colours of the temple and reflections in the lake. 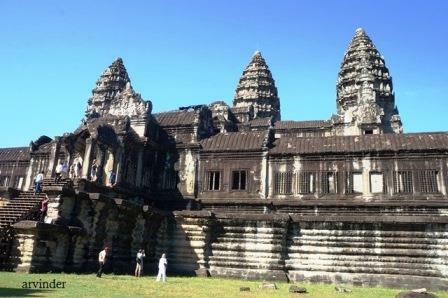 Angkor Wat is a vast complex so take your time exploring as the more you look the more there is to see. Just to give you an idea of how big the trees are, I am 6 foot tall. The Bayon temple complex at Angkor Thom is another fabulous site to visit. 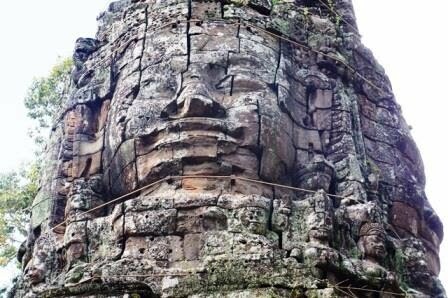 It is renowned for its iconic sculpted faces and walls of ancient carvings and was the last capital of the Khmer regime. The Elephant Terrace is another exquisite feature as is the carved warrior bridge. Climb the nearby hill for a fabulous sunset view across the temples. Picture I took of a tourist at the pedestrian bridge, the bridge takes you to Neak Pean temple, back in the day people used a boat. The temple itself is in a middle of lake in small man-made island. The whole complex at Prasat Phimeanakas is very impressive, the temple is in kind of Pyramid Shape. Loud cricket noise around the temple complex. Another building n the same complex. Yes, I climbed all the steep Stairs. Back in the day people believed the higher you get the closer you are to God. Lots of tourists come here for Sunset photos, I was tired from walking all day, climbed up a whole bunch of stairs, and it was full of tourists. The temple itself is very beautiful. I decided to look around, though not to stay for sunset photos, instead took sunset photos from the side of a lake. Beautiful Temple Complex with fewer Tourists, my tuk tuk driver dropped me off in front and picked me from the back exit. There was a Shiv ling in the temple, might have been a Hindu temple at some point. See it while there, The stonework is really beautiful there. Siem Reap is the perfect base to explore the Angkor temples but plan well and you’ll see some of the most amazing architecture in the world. 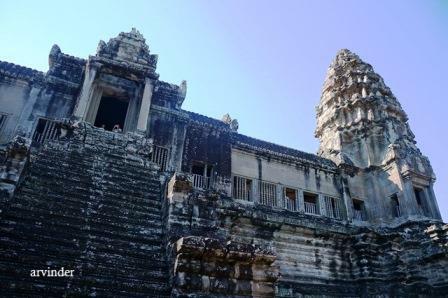 Above Picture I took at the Angkor Wat, just thought it was a great shot. First Picture Above of a lady selling T Shirts and other clothes at one of the temples in Siem Reap, I bought a pair of shorts from her, she was all smiles when I asked if I could take her photo. Second Picture of a Lady Selling Mangoes, they were delicious and the much needed energy and hydration from walking all day. Wow, that's an amazing trip. You really have been to great corners of the world. Hi Arvin! This is amazing! I am so glad I found your blog! I am a first generation American. My family is from Cambodia! I am still planning a trip to see Cambodia for the first time in the near future! Your trip looks amazing! 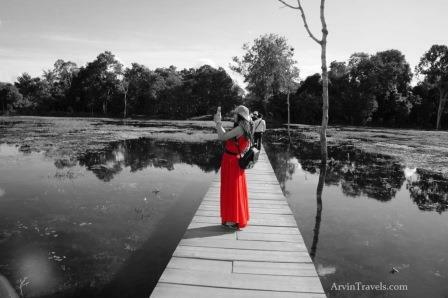 Thank you for visiting Cambodia --- the photography is beautiful! That was a great tour. The temples are quite aesthetically pleasing. I've heard so much about the temples, I just wish I could visit there someday to see things for myself. Cambodia should be a good place tourism. Interesting! That was a great tour and I'm sure you had a nice time over there. I would really love to visit these temples. I need to have a firsthand experience about the statues. I hope one can ask questions and get answers? Cambodia is indeed a place to visit. Thanks for sharing your experience.